Thanks for this review. The translucent version isn't sold here in Holland. You can buy the opaque version (Blue, red, green etc) as a blister pack in almost every supermarket. I prefer a normal pencil, but these Bic's do have their merits. They are cheap, and the quality isn't bad. The eraser is bad indeed. 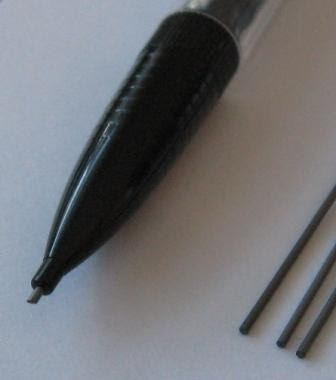 I must admit that I'm the only one in the poll (as of right now) to have voted "no" - If my favorite P205 isn't around, I'll usually be using one of those cheap-but-pretty-high-quality Pentels. You get all types of colors of these in the Good ole USA. They sell these in 20+ packs for 5.00 or something the reasoning I think they break easil,,, I think they come in .9mm along with the .7mm but I never seen a .5mm one. Break easily? Not my experience! Perhaps there is a difference, because the Dutch Bic's are produced in France. I find that the BicMatics are hard to fix when they're jammed; I just can't unscrew the parts of the pencil to see what's the problem! (Except for the eraser, of course). So I just get real annoyed, and hence I don't use those pencils anymore. Now I'm sticking to my good ol' Dr. Grips. pretty several versions of this have been mad eover the years. i remember using one back in 5th grade or so? i could be mistaken, however. 0.5mm was available, as that is what i used almost exclusively. A damn cheap pencil, but oddly enough, they don't write all that bad. I don't think that the BIC Matic is actually made for being refilled. I would rather say that it is intended as a reasonable alternative to wooden pencils, just like the Kreuzer Blift 30+ years ago, the EFAmatic and probably the Dixon Ticonderoga Sensematic. 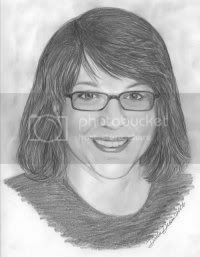 I used to use only mechanical pencils in my art, but I switched over (mostly) to Tombow Mono Homograph pencils. I still use mechanical pencils to draw some fine hairs, eyelashes and eyebrows. I'm pretty picky about mechanical pencils, too. I can't stand it if the graphite is waxy/greasy in texture. I found your blog very interesting and I just posted about it on my art blog. Thanks for your comment and link. You may have have aleardy seen it, but if not, you might like to check out this on Tombow and other Japanese premium woodcase pencils. Hello Matt. Good to hear from you. Glad you are still reading the blog. Have you noticed this problem of the lead pushing back up inside the tip? Strange you should about the eraser declining in quality - I thought it had improved, even though its still pretty B-grade. Could well be the source of manufacture though. I have never seen anything other than Mexican production. I have not encountered that problem but then again that might also have to do with the source of manufacture. I believe the last batch I bought was from China but I noticed that the ones made in France always seemed to work best. I dont know what country the current stock is made in as I havent purchased any fresh ones in about a year. I went looking for cheap disposable mechanical pencils and came out of the local (midwest USA) Walmart with some .9mm Bics. 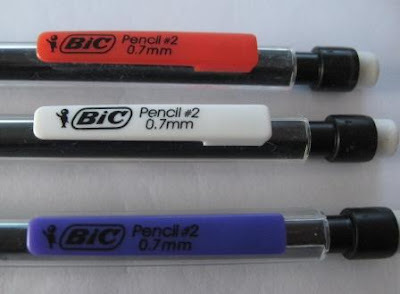 The package doesn't say Bic Matic, just BIC #2 pencils, but they look similar, having the same shape but a different color scheme. They have transparent hex shape outer barrels, various bright inner barrel colors, translucent white clip and pointy end. Nearly invisible is the "MEXICO" molded into the side of the clip. The mechanism has a surprisingly smooth feel with a solid and satisfying "click" sound. I have no complaint about the eraser, it gets the job done. Lines are fat and dark as one would expect from a .9mm #2, but the writing feel of the lead just isn't as smooth as the Pentel leads I've become used too. They'll get the intended job done, but I'm not tempted in the slightest to replace any of my Pentels with them. Hmmm I bought my 5 pack 0.7 in NZ about 4 years ago and they were made in France- I'm still using them now! Not sure where they are made now. They're okay for general use. The lead is quite dark & the eraser on these are pretty good. Your blog is awesome~ Thanks. I have had the pencil for not that long but have found that while it CANNOT replace the Pentels, it can still write better for a really long time than the Pentels...Maybe I'm just used to the feel of wood pencils; after all, thats all I used back in middle school! It has a really useless eraser, but that's OK because the pencil is an old favorite, been using it on and off since I found my first one on the floor in first grade. I recently took the Professional Engineers exam in California administered by the National Council of Examiners for Engineering and Surveying (NCEES). 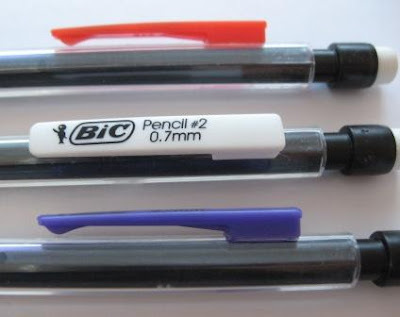 The pencil they provide is the infamous BIC Bicmatic Grip Mechanical Pencil. No, you are not allowed to bring your pencils or erasers for the 8 hour exam, for exam security reasons. The lead frequently breaks and as you try to erase the lead advances. Wonderful problem during an 8 hour exam. I think this could rate as one of the worst pencils in the market. Why they won't charge an additional $10 and provide a decent Pentel is beyond me. Out of curiosity, are there refill erasers for this pencil? To me, this pencil has always been the disposable MP... I pretty much stopped using the pencil once the eraser runs out. Meh, but that's just me though. Andrew - yes, replacement erasers are available, although you might have to hunt for them. It's because of this pencil that I landed here! In our corporate office supply cabinet there are boxes and boxes of BicMatic grip 0.5mm pencils. After one day of using this pencil and the horrible rough gray standard issue lined notebook, I realize that my life would be better with an upgrade in writing materials!! This weekend I will make a visit to the art supply materials and try out some of your recommendations on the Top 5 list. Thanks for your helpful reviews - they are fun and informative! My only request is that you link the reviews on the Top 5 list to the actual articles. 1. The above classic but the transparent white clip labelled BIC Pencil #2 0.7mm. In sparkly violet with white end cone. Eraser average but acceptable. Don't like the final squared off end sleeve design and dosen't look good when using. Lead quality average (3 * 90mm leads) - just replace it with AIN 'B'. Quite like the hexagonal barrel to mimic a wood pencil. No actual grip area and thats fine by me. 2. Hang sell pack of 2 BIC Atlantis 0.7mm pencils with 2 joined tubes of 5 erasers and a supply of HB leads. Hard rubber grip that works although I still can't work out why rubber grips have to flare out in the middle - I much prefer a stick design where the grip is the same diameter as the barrel. 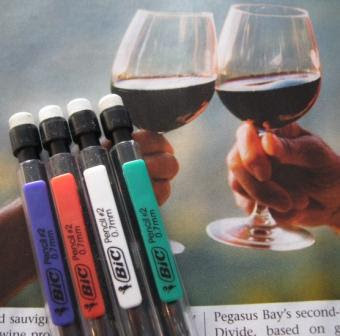 The barrel is transparent with the labeling - BIC ATLANTIS PENCIL 0.7. Excellent eraser (with clear eraser cap)right up there with the best Ive tried - I just hope the 5 spares are the same quality.I like the final conical metal end sleeve on this pencil with its nice taper. Very thin pocket clip which may not last although is quite grippy. Again, lead seems to provide too much resistance on the paper and can only be fixed by changing to AIN 'B'. Good value though with the extras and Made in France to boot. Can recommend. Once, at school, I found an opaque beige and brown Bic pencil in a drawer. I lost it, unfortunately. Does anyone know where I could get another? I have a couple of brown Bics...cream body, dark brown point and eraser ends. One has a red eraser and the other white. Both marked >France< and no pocket clip. Any idea when they appeared? I have some of those Brown/beige Bics (In fact I have one right on my computer keyboard at the moment.) This one is around 20 years old. I remember seeing them pop up around 1986 or 87. Back in the dark ages when there were three kinds of mechanical pencils. KwikerKlickers from Pentel, clutch drafting pencils, and those old twisty Scriptos ;) I've always liked the older "Bicmatics", the newer ones aren't quite as good. I still think they were designed with "disposible" in mind, but I'd manage to refill mine. The older bicmatics must have used a thicker outer case or a less brittle type of plastic. I remember in middle school we would tear the front of of these and tape elastic bands from the eraser on the back to the front sides. Then we would pull the eraser back, stretching out the elastic and put a projectile(usually a paper ball) in the 'barrel' and release. They had really good range. There was a big crack down on them when someone used one to lob BB pellets across the cafeteria one day. 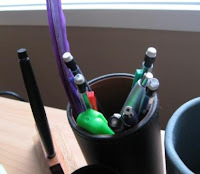 Not that long ago I tried to make one again but the pencil cracked and shattered where the eraser holder hit the pencil. They only last a few shots before completely falling apart now. Picked up a 36 pack of these a few weeks ago I had some .7mm from years ago and have a few lying around that say made in France. The newer ones are made in Mexico I find the lead in these tends to break easily not sure if it's the plastic advancing mechanism or the lead it'self. I don't like these for drawing they are too lite but work great for writing (since you don't have to apply much pressure) in a notebook or pad of looseleaf paper in a binder. I've seen a 0.5 before. And not just a grippy one. The cheap bics are what I used all through high school. My mom wouldn't buy me anything more expensive than that! So I got used to them. Your right about the lead going back in when the button is let go. A lot of times I had to re-advance the lead numerous times to get it to the right length. But I kind of like that (or at least I did). It's kinda like this old computer I had. It froze all the time and acted funny, but I got to know it's tics and I got used to it. These pencils really aren't too bad. They got me through college! I used these exclusively up until my last semester when I started getting more into pens and pencils and experimenting with different ones. I've never had one break or fail to work properly, just run out of lead quite often. Many times I would have the clips break on me and they would look pretty ugly after being thrown around in a backpack for months at a time. Great bargain pencils IMO. I have had some issues with some of the erasers, while others worked fine. I have a 0.5mm version that I found with an eraser that hardly works, but the ones on my 0.7mms have always worked fine. I have a French made Bicmatic that has a black body, black eraser and turquoise clip. Found it it lying on the ground somewhere. It is actually a pleasure to use. The eraser's not half bad. I've tried the Mexican versions with the clear bodies, and they feel very different. For a start, there's much more flex in the shaft. I've also have several of them break at the tip. Interesting. Thanks Cedar Boy. I would have expected a global like BIC to enforce a global quality standard and not tolerate differences from one supplier to another. The BIC Round Stic Grip Mechanical Pencil .5mm is a good quality everyday pencil for the price too. Any review for that? oh and if you ever come across a bic atlantis mechanical pencil or the bic round stic grip,could you do a review on them? We have the .5mm ones in Canada, they are readily available. Does anyone know if the older all gray bic-matic pencils are sold anywhere? That was definitely my favorite pencil growing up. I was upset when they were replaced with the clear casing but never really thought to buy/look up where to get the older gray cases until now. To refill this pencil, pull out the eraser! I rather like Bic Matics. The trick, of course, is that you need to put some nice Pentel lead in it, and replace the eraser (Faber Castell refills work). I also usually rip off the clip, same as with all my other pencils. Sure, it screams "cheap". But it feels good in the hand, writes well, and has a big eraser. Just... works. I have seen many BICs made in France and also many from Mexico. I have had 0.5mm BICs and also have a 0.9mm one that has no lettering at all, not even a country identification. I must correct the last comment I made. The 0.9mm BIC I have has no letting on the clip, but DOES have country identification. It is made in Mexico. This BIC is the WORST I have had in the way of the lead going back inside as you try to write. It goes in so easy that I can barely even write with it. I can even push it in with my finger, and it cannot poke through a paper, as it goes in so easily. 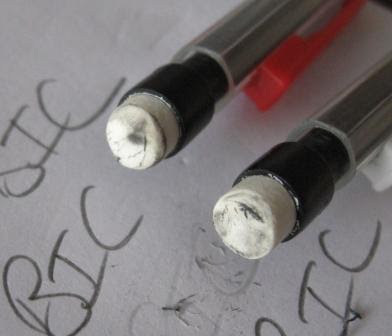 As for the erasers of the BIC pencils I have used every now and then, they do a good job. Personaly I find the click of the bic pencil to be an oily and greasy sound. I personaly prefer the Kuru Toga from Uniball or the Tk fine vario.